Organizations around the region are stepping up to help, as workers and their families struggle during the nation’s longest partial federal government shutdown. The help has come in various forms. “The key is to take off some of the pressure from these folks (so they can) worry less about where their food is coming from,” explained Greg Giordano, assistant tax collector of Pasco County. The federal government partially shut down on Dec. 22, in the midst of a budget battle between President Donald Trump and members of congress, over funding for a border wall between the U.S. and Mexico. Over the past weekend, Trump offered a deal that would include money for the border wall, while granting some immigrants protection for three years. But, Democrats were not moved by Trump’s offer. The impasse affects about 800,000 federal employees, including some who are not working during the shutdown, and others who are working without pay. The U.S. Coast Guard is one group of federal employees who are working without pay. 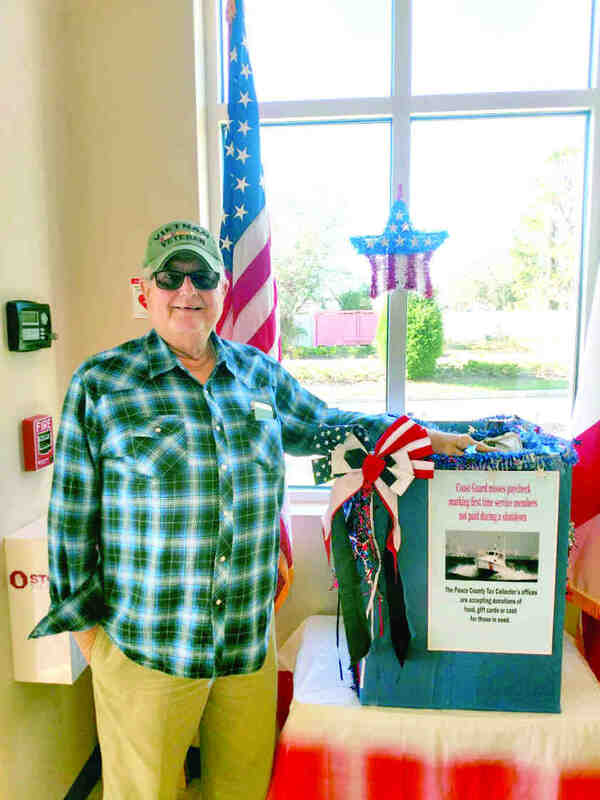 Pasco County Tax Collector Mike Fasano was inspired to specifically help those troops. The five branches of the county’s tax office intends to distribute donations to the troops and their families. On Day 1 of collections, Tom Kliebert was at the tax collector’s office to offer support. 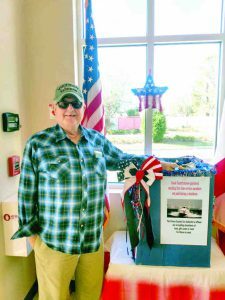 The Wesley Chapel resident went directly to the grocery store to purchase donations when he learned online about the tax collector’s effort. Debby Palmer, also of Wesley Chapel, received the notification through email and also wanted to help. “I feel like I’ve been very blessed in my life, so I try to contribute where I can,” she said. She brought in four bags of groceries to her local tax office. he tax collector’s five branches began collecting donations on Jan. 16 and accumulated more than $2,300 in cash, 91 bags of groceries and more than a dozen gift cards within the first two days. (For addresses of branches, go to PascoTaxes.com). Father and Son Love Ministries, at 24156 Foggy Ridge Parkway, in Lutz, also is offering a helping hand. Pastor C.J. Johns heads the Lutz church, which has opened its doors to federal workers and their families every Friday. Church staff and volunteers, from noon to 3 p.m. on Fridays, will give out bagged lunches, plus supplies of food for a week, for those requesting it. The church also understands that some families won’t be able to afford to drive to the church, so it is willing to deliver food boxes to homes if they provide 48 hours’ notice, the pastor said. Before the shutdown, the church was already operating a food drive and now has prepared for a larger turnout. Publix has supported the church’s efforts, Johns said, noting the grocery chain recently donated surplus items from the holidays. Besides providing food, the church also offers free clothing and personal hygiene items. It also understands that children need relief, too, so the church will make toys, birthday cakes and cupcakes available, the pastor said. The church plans to keep the drive open 30 days after the government reopens to help workers get back on their feet. Restored Hope, at 13703 17th St., in Dade City, also is committed to assisting federal workers for as long as necessary. The nonprofit organization welcomes workers to stop by its center on Mondays, Wednesdays or Thursdays from 9 a.m. to 2 p.m.
Federal employees are asked to bring identification or their last pay stub to verify their status. The organization’s pantry room is filled with nonperishable items and clothing. 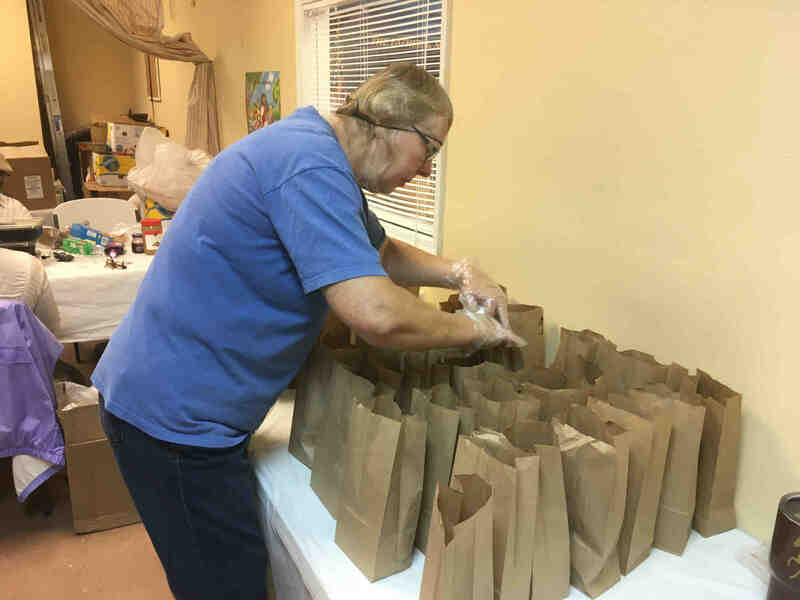 Many items were leftover donations given by Metropolitan Ministries over the holidays, said Doreen Kennard, bookkeeper of Restored Hope. Kennard added that the organization will do what it can to help workers pay past due bills. During the federal government shutdown, Pasco County Utilities also is working to help federal employees, who are also PCU customers, develop an action plan to ensure continuation of services. Pasco County Utilities will waive late fees and provide extensions for utility bills due by any federal employee who is on furlough or is required to work without compensation, as long as supporting documentation is provided. Customers in need of assistance should call (813) 235-6012 during regular business hours. Other acts of kindness can be seen throughout the Tampa Bay Area. Tampa Bay Salvage, at 37832 Meridian Ave., in Dade City, is accepting donations of food and personal hygiene items at its Dade City and Palm Harbor offices. The Humane Society of Tampa Bay is offering pet food to support furloughed workers who have pets. The donations are available on weekdays from noon to 7 p.m., and weekends from 10 a.m. to 5 p.m. Verification is required. The Crisis Center of Tampa Bay is connecting federal employees of Tampa International Airport with community resources. Feeding Tampa Bay also has set up a food bank for TSA workers, and TECO is offering payment extensions on electric bills. The Florida Aquarium in Tampa will also offer a day of relaxation with one free admission to federal workers. Pasco County Tax Collector Offices (Land O’ Lakes, Dade City, Wesley Chapel, Gulf Harbors, New Port Richey); Monday through Friday from 8:30 a.m. to 5 p.m. Restored Hope, 13703 17th St., Dade City; Mondays, Wednesdays, Thursdays from 9 a.m. to 2 p.m. Call (352) 437-4815. Father and Son Love Ministries, 24156 Foggy Ridge Parkway, Lutz; Fridays from noon to 3 p.m. Call (813) 846- 9993. Tampa Bay Salvage, 37832 Meridian Ave., Dade City; Monday through Saturday from 10 a.m. to 5 p.m. Call (352) 437-5231. The Florida Aquarium is offering one free admission to federal workers with identification. Pasco County Utilities will help customers that are federal employees who are not receiving pay, or are furloughed, to ensure continuation of services. Documentation is needed. Those needing assistance should call (813) 235-6012.